There are species of aphids and mealybugs that attack the roots and the crown line of plants. Many times when plants are pulled out of the pot, whitish fuzzy bugs in the soil or on the roots can be seen; they are the root aphids or root mealybugs. In Hawaii, the pineapple mealybug is common. The adult females are described as plump and convex in body shape and pinkish in body color. Primarily a pest of pineapple and other bromeliads, yet these mealybugs also attack banana, celery, citrus, cotton, coffee and hibiscus. Wherever pineapple is grown, the pest is present including all of the major Hawaiian Islands. 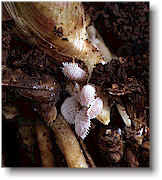 Plants rarely die from a mealybug infestation. Control of this pest depends on controlling the ants which provide the mealybugs shelter and protection from predators and parasites. Without ants, mealybug populations are small and are slow to invade new areas because of the presence of the many natural enemies (the good guys) that are in Hawaii. In infested areas of the garden, after the crop is removed, the soil should be turned over and all crop residue removed including grassy weeds which may harbor the mealybugs. Host plants of this pest (listed above) should not be grown in this bed for at least a year.